At my core is the drive to build the very best I can - to craft a custom 1911 to uncommon levels of reliability, performance, refinement, beauty and innovation. No matter how long it takes. No matter what it takes. I am a one man shop whose builders name goes on every pistol. In my shop, pride of craftsmanship and extreme attention to detail come first, before speed in manufacture or profit. There is no foreman looking over my shoulder rushing me along, no assembly line, and no production quotas. You are looking at a craftsman's soulful expression poured into metal. I believe in using whatever metalworking method is optimal to accomplish the goal of building the very best custom 1911 possible. 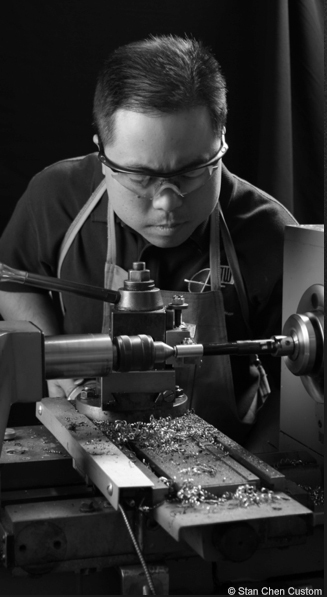 Here in my shop I employ 4 and 5 axis CNC vertical machining centers, manual milling, turning, precision grinding, TIG welding and of course meticulous hand work. I program using powerful CAD/CAM software, which gives me the ability to perform complex 3D machining and surfacing via multi-axis toolpaths. I have an extensive battery of unique, purpose-driven tooling and fixtures, which were all custom built here in my shop. I am always pushing to expand my capabilities to be able to work metal in ways not commonly thought of, and enable my pursuit of the ultimate custom 1911, without limits in terms of process or metalworking capability. If I feel it is best done by hand, I will do it meticulously by hand. If it is best done with another method, be it elaborate, custom one off fixturing, design, prorgramming, precision grinding or 3D machining, then that is what I will do. Challenging Conventional Wisdom. Innovating and Creating an Uncommon Result. I strive to create custom 1911s of uncommon function and beauty. In doing so, I constantly try to keep a fresh perspective when looking at the platform. I seek thoughtful design to push the envelope of what a custom high performance custom 1911 can be. I have a never ending quest to make this iconic platform better in terms of reliability, durability, accuracy, ergonomics or artistic expression. This could take many forms, including a part manufactured from scratch, a new fitting process, a new grip texture, or a cosmetic enhancement that sets the pistol apart. I try to never just regurgitate or accept "conventional" thinking, and test and prove everything for myself. Only then can I truly and confidently keep what is good and discard the rest. I even make it a point to study techniques and methods of craftsmen and manufacturers in other trades and industries, and take what I learn to apply to the crafting of my pistols. Again, all this is done with the goal of taking the custom 1911 in new directions both functionally and artistically.